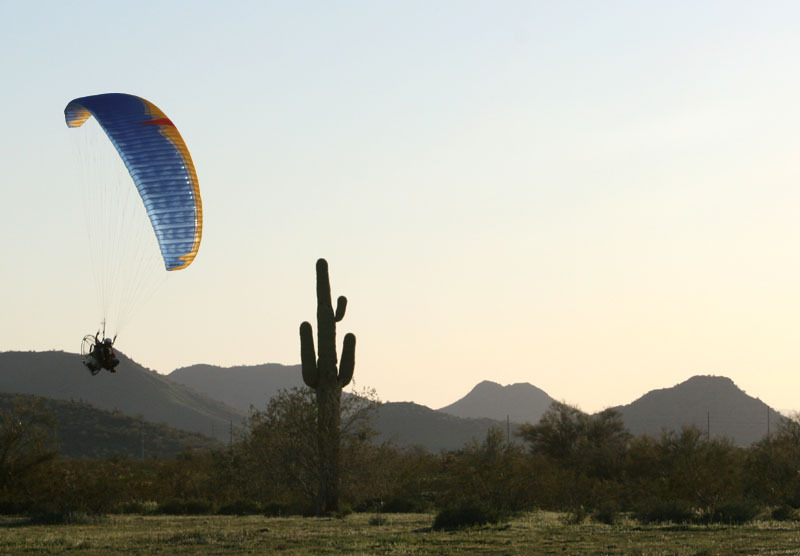 The Spice was specifically designed for paramotoring, with emphasis on stability, maximum speed, and of course, excellent manoeuvrability. The Muse and Eden 2 have both built a formidable reputation for use under power and the Spice completes our range as a high performance paramotoring glider. Newly developed airfoils have allowed for higher speed and for low fuel consumption. Immediate and precise reaction to control input, manoeuvrability, easy take-offs with ample lift, and easy landings reflect the properties of the new Spice. The Spice has 63 cells and an aspect ratio of 5.8. The construction uses diagonal ribs, “Depowering lines” and line configuration as used for the Intox. Colours and designs are the same as those used for the Magus. The Spice comes with a 4 point riser system and is equipped with special split A risers giving more stability by accelerated flight. Of course it also helps for big-ears. The use of high-quality materials and constant quality control during our own MAC PARA manufacturing process together with consistent development work produces high quality products. These are the questions I´ve been asked recently, and I‘ve answered with my usual skepticism and my I´ve-heard-that-about-every-new-wing-in-the-decade lack of enthusiasm. One thing that did get my attention, though, was who gave the favorable opinions. I´ve flown quite a few of Mac-Para‘s designs in the last couple of years and I‘ve tended to like them, but I wanted to try out the Spice and see for myself. So, I asked for a demo and a few days later it arrived. At that point, I had no intention of writing a review on the wing. I just wanted to see what it was like. So off I went with my demo Spice 22. I have had a personal policy of not even bothering to fly anything with a DHV rating higher than a 1-2 because I‘d never consider buying one. I believe that the Spice 22 is not yet rated and until the rating is actually granted, it will be hard to guess what it might get, but the Spice 22 is definitely not a beginner wing, and to some extend comparing its performance to DHV 1 and DHV 1-2 wings may somewhat unjust, as my guess is it will probably end up in the DHV 2 class and should really be compared with other wings in that performance group. We both guessed that it would sink like a rock when the fan stopped, so we decided to do a very unscientific test. We both climbed to 1000‘AGL, shut the motors down, and checked out which wing would sink faster. Believe it or not, the little 22 meter Spice sank slower than the Eden III 28! That was interesting. So we restarted and climbed again, side-by-side, and the little Spice actually climbed bettter than the Eden III 28 too! We then decided to do a little speed test and we pulled trimmers all the way in (which is slower-than-neutral on the Spice) and pulled up next to each other. The Spice was just a tad slower. Then we let the trimmers out and the Spice was faster, but not by a tad, by quite a bit! We both stepped on speedbar with trimmers all the way out (our“racing configuration“) and the Spice just roasted the Eden III. We thought it was totally amazing, and so, the desire to figure out just what this little wing could and couldn‘t do was brought into focus. This article is the result of our very unscientific comparisons. First, let’s look at the wing itself . 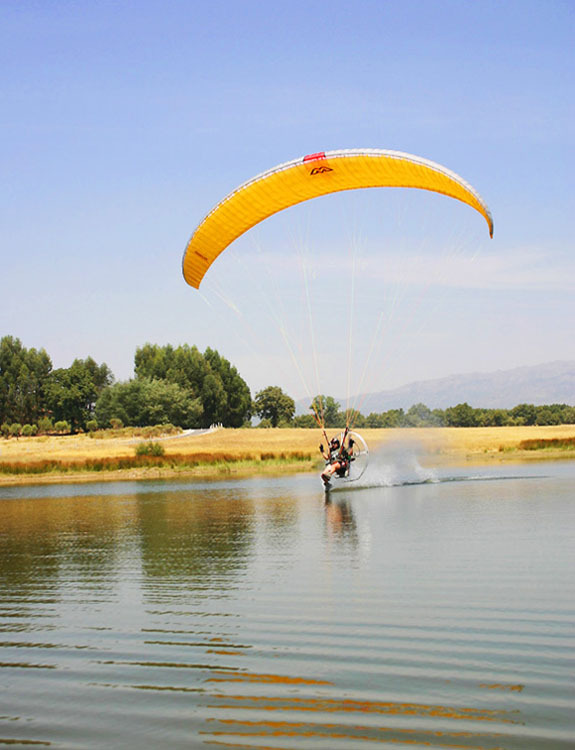 It is very small, high-performance paraglider. It came equipped with trimmer and speed bar, but no split-A’s. The trimmers are slightly unusual in that there’s a line on them that marks the neutral position, which is the “full in“ position on most riser sets. This riser set allow you to pull the trimmers in slower than neutral. They can also be let out quite far for the fast position. The speed bar is standard, utilizing a 2-pulley system. The rest of the wing is standard MacPara. I tired to make some actual measurements so hopefully other motorheads could relate, and also so I could avoid the completely subjective stuff. Some hard numbers are helpful but, there is also subjective stuff that is important. I look for a wing that is a good „ dual-purpose“ wing, one that can motor and free-fly equally well. Here‘s a brief summary of my subjective opinions of the Spice 22: WOWIE-KAZOWIE! This thing is a hot rod! If you‘re middle-aged, like me, and you‘ve been Jones-ing for a Lamborghini or some other little red sports car, the Spice 22, fits! Ther‘s not much this little wing does poorly. It inflates easily, it turns sharply and crisply, it has a good sink rate (trim in), a good glide ratio (subjctive-I was unable to measure this), and a great speed range. The trade off for all of this “good stuff“ is that it is a sports car, and it is not inteded for beginners. If you´re not on top of it, it can get you into trouble. I know this becouse my first flight with it almost ended up in the treees when I figured I‘d yank it around a bit down low and ended up doing a 270 degree turn where a 180 degree turn was intended. The thing turns so fast that I was past my intended roll-out point before I knew it and by the time I did roll out I was heading for a line of trees. And if the wing gets distribute (from turbulence or heavy heads) it‘ll rock-and-roll before it settles out. Inflation:I rate the infllation of a wing on two different characteristics, both only really matter in no-wind ( heck, you could inflate a bedsheet in a 10mph breeze!) One is how „easy“ or “hard“ it is to pull the wing up overhead - a subjective measurement of how much energy the pilots needs to put into the inflation. The other is how consistently and evenly the wing inflates in no-wind. The little Spice 22 is extremely easy to inflate. This is probably due to the fact that there is so little cloth back there that you hardly feel it! A little pull and up it comes. With regard to how consistent and evenly it inflates, it is a sports car and it won‘t necessarily center itself every time, you´ve got to work a bit for it, but nothing that isn´t completely accetable. After it´s inflated, though, that´s where the fun starts. Its small area requires some pretty significant airspeed to get airborne, so be ready to pour the coals to the motors and RUN! In my month of evaluating the Spice, I didn’t blow a single low-wind launch with it but do some of the most interesting “Jesse Owens“ style launches of my career. Handling: Handling is an area where the wing really shines. This thing TURNS! The brake pressures are light with the trim in any position, and roll-rate is exceptioinally fast at all trim positions. With trim out, it only takes a pull about 12 inches and the little weight shift to get her spiraling, and spiral she does. If held in the spiral she’ll lock in, the wing will point toward the ground and the g-forces quickly start increasing. It’s definitely fun, and a good way to get down. Again, in my opinion this is not a beginner wing. The Spice rolls so quickly that even in an experienced pilot’s hands there is no real room for poorly thoght out control imputs. I let my mind wander twice early on with the Spice and found myself in unhappy situations. One was the tree incident above, and the other was while doing wingovers low to the ground when I almost pounded myself in. After the wing notified me that it demanded respect, I didn’t have any futher over-controlling problems. Big Ears: The demo version of this glider did not have split A’s but the outer A lines could be pulled down to induce ears. Ears are easily pulled on the Spice, and flight with them in is a stable affair. Sink rate increases noticeable, although I didn’t measure it. Ears were pulled with trims fully and fully out, with little difference noted. Upon release of ears they automatically and quickly roll out. Single-ear performance is interesting. If you pull the left ear, the wing will bank considerably to the right. With trim out, a single ear and no other input, the wing will bank up away from the ear enough that after 360 degrees of rotation you are in a mild spiral. This is a somewhat interesting behavior that I haven’t seen that often. The strange part is that if you use your left hand to pull the left ear, there is no way to use your left hand to apply left brake to straighten the wing out. Basically, It‘s turning right and there‘s not much, other than weight-shift, that you can do about it. 50% Asymerics: These were induced by pulling down the A riser on one side. Several interesting behaviors were notice here. First, if you pull the riser slowly and not very far you will get the leading edge on half the wing to „close“ but the wing will largely stay inflated. This situation creates a turn away the collapse, similar to big-ear performance (only with a bigger „ear“). This „mode“ is quite stable and can be held pretty much idenfinetly. With trim in it’s pretty easy to get into this mode, with trim out it’s harder and the collapse wants develop more fully. If you yank the riser down and hold it, the side of wing will deflate and trail rearward. It has a very strong tendency to reinflate though, and it takes quite a bit to continue holding it down. Holding it down quickly(within a secondor two) becomes a moot point however, because the wing has banked up in the direction of collapse so severely that you need to let go of the riser and get the wing back under control. This rapid roll toward the deflated side is accentuated with trim out. Neither I, nor Eric (who’s much more gutsy than I am) nor Jeff Goin who also flew it and did induce an intentional 50% asymetric, had the nerve to do a 50% asymm with trimmers out while on speedbar. If a collapse is induced by banging it down and immediately letting go, the wing will immediaterly start to rotate and also reinflate, with rotation stopping and re-inflation occuring after about 120degrees of rotation. So, asymetric deflations with the Spice are uneventful both with trim in and trim out if you donť bang it down and hold it. If you do bang it down and hold it, you’re in for a bit of a ride. B-stall: B-stalling this wing is pretty straigtforward and its performance is actually quite docile. We expected a big surge after release of the B’s, but the surge was pretty mellow. Rough Air performance: As I‘ve said, the Spice 22 is a hotrod. One of the thing that makes it a hotrod is its quick roll rate. This roll rate can be induced with the brakes, with weight-shift, or with anything that displaces the wing from that „ideal“ spot directly over your head. So, in turbulence the wing can get displaced from the ideal spot either fore/aft or side-to-side, as any wing can. After this displacement, the Spice tends to attempt to return to the ideal spot rather rapidly, which is to be expected. Nothing „squirrelly“ about it just what would be expected from a hot rod like this. I flew this wing in some light latemorning thermals and also in some trashy pre-storm air and I didn’t suffer any collapses or tucks. One pilot said that he did suffer a tuck in some fairly strong bumps and reported that the recovery was somewhat “Spicy“, as expected. Now onto some of the non-subjective things, things that could really be measured! Speed: Speed was measured with a Megallan GPS, flying a straight course directly over a road in both directions at 300’AGL and averaging the numbers. Measured speeds were: Trim Neutral--26mph, Trim FAst--29mph,Trim Fast w\full speedbar--35mph. Power Required: I don’t know if this section will be of value, but I measured it anyway. For reference, I was on SkyCruiser with geared weight-shift, an RMD100 engine, swinging a Sensenich 46x29 prop. Full throttle RMP in a climb was 9980. Actual altitude of my flying site was 640’MSL at launch, density altitude at the time of the tests was reported as 2200‘ by the AWOS at the local airport. Power requirements for straight and level flights, as measured with a FlyTec 450 vario were“ Trim In -- 7650RPM, Trim Fast -- 7850RPM, Trim Fast w\full speedbar 9000 RPM. Climb Rate: I only measured climb rate in one configuration (it was getting dark!). The flyTec said I climbed at an average of 380ft/min from 200’AGL to 1000’AGL with neutral and the RDM singing along at 9980 RPM. Sink Rate: This was an interesting test to make, especially the last one which I call“lawn dart“ mode! In each test I climbed to 800‘AGL, went to idle, allowed the system to stabilize down to 600‘AGL, and then started measuring. So, measurments were: Trim full in – 340 ft/min, Trim neutral 360 ft/min, Trim Fast -420ft/min, and with Trim Fast and full nspeedbar, a whopping 760ft/min! This makes sense when combined with the fact that it requires 90200 RPM to keep it level in this configuration. These are the only tests was able to perform before I had to let somebody else play with this very cool hot rod. I wish I could’ve played with it longer, but I guess I’ll have to buy one to do that! 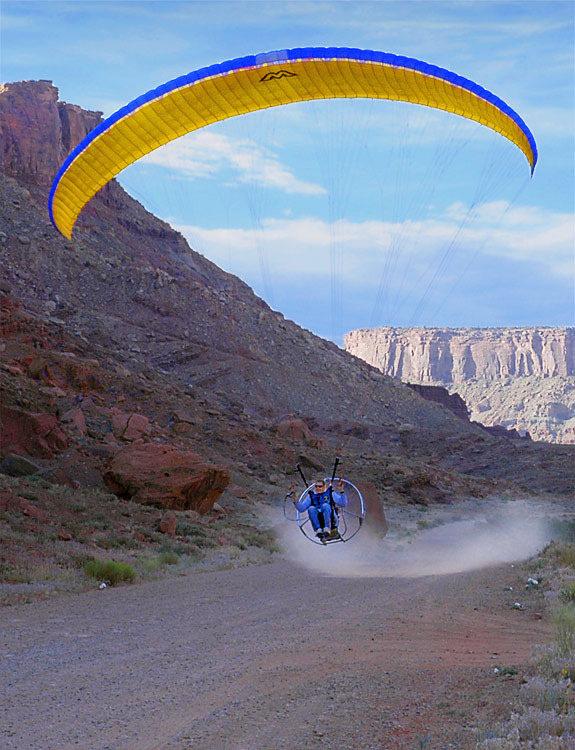 If you are looking for a wing that is good at just above everything, this is a strong contender, keeping in mind that it is not for the heavyhanded, and it is not your“go for a walk in the sky“DHV1 cruiser. This is definitely a serious wing for serious PPG pilots. 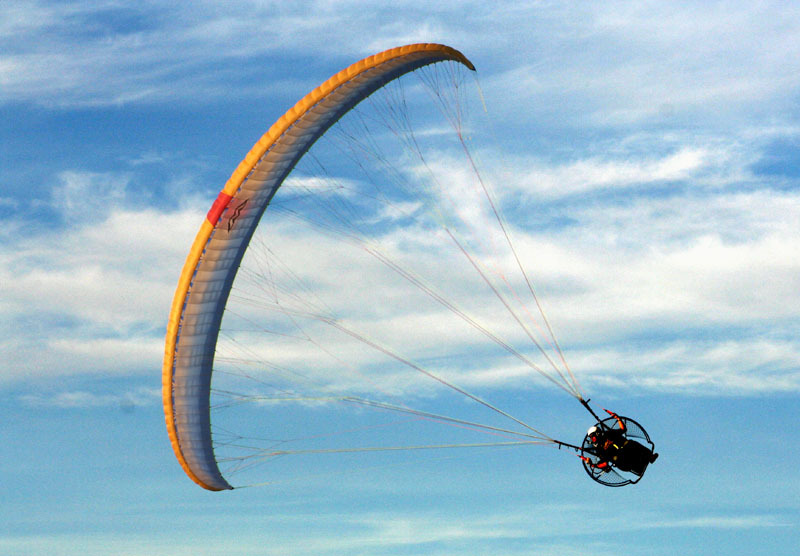 The Spice is manufactured using the paragliding industries well established lightweight material with excellent durability; Skytex 40, from Porcher Sport (NCV). Because for any glider, the part that always wears out first is the leading edge, we use Skytex 40 with double water repellent coating E77A for this. For the less stressed areas of the sail we use Skytex 40 with E38A coating. For the supporting and diagonal ribs we use Skytex 40 with “hard finish” coating E29A. This gives the advantage of a sail that is both lightweight and very durable.